I take the furkids to a snazzy little pet shop to be fitted with their first Halloween costumes. Nothing looks good on Duncan. His waistline disagrees with all the clothing. He knocks off adorable hats designed to make him look like a pumpkin. He refuses to be Elvis (the Vegas years) in white sparkly duds. He will not be a cowboy for all the treats in dogdom. So Duncan ends up in a lumpy looking t-shirt with a jack-o-lantern face on the back – relieved to get off so easily. But Emma, oh Emma! She struts the latest fashion – gleeful as a pumpkin, a bride, a ballerina. More, more, must have more. Get this off and let me try that one on. She roots through the packages seeking the perfection she desires. Then the wings are unfurled – glorious black bat wings held on by a little harness. They flap gently as she glides past the admirers lined up along the bags of kibble. The crowd goes wild. They match her coat, they match her mood - nothing left to do but write the check. The wings are in the linen closet and Emma is lurking by the closet door. Every time the closet is opened, Emma rises onto her hind legs and twirls. She wants her wings. One week to Halloween and counting. Company arrives and Emma and Duncan get to show off their costumes. Duncan looks pathetic but he does not care. 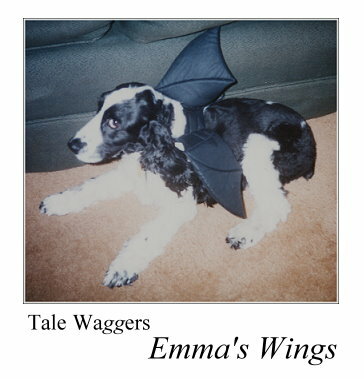 Emma is regal as the world’s first winged spaniel. She cannot keep from prancing. The night is dark and bright. Duncan is resigned to wearing the pumpkin t-shirt and Emma is dancing, dancing, dancing in her wings. I take a chair onto the porch and set up the candy basket. Then monsters, aliens, princesses and demons clamber up the steps and take their candy. Bat dog and her badly dressed sidekick watch through the storm door. When they are noticed, Emma gives her wings a little jiggle for effect. Children squeal with delight. Her sidekick is bored and toddles off for a nap, but Emma is fascinated by all the doings in the dark. In between monsters, I bring her out and she perches on my lap, wings quivering as she drinks in the scents of the night, vibrating with excitement. It is a magical night. Two weeks later she was gone. She suffered sudden and massive liver failure. Nothing could save her. This year Emma’s wings hang in the closet …and Emma’s magic fills the night sky. She didn’t need wings to fly.